My last post was all sappy messages of love with pictures of pretty flowers and adorable children and adorable children holding pretty flowers. So, in the words of Monty Python, “And now for something completely different.” This time I’m taking a journey into the dark, smelly, watery underbelly of Victorian London: the sewer. I’m excerpting from a four-part article titled “Underground London” found in All The Year Round, edited by Charles Dickens. These articles were published in 1861, three years after the Great Stink (Here’s a Stuff You Missed in History Class podcast on the Great Stink) and during the time that Joseph Bazalgette worked on the sewers. After All The Year Round, I’m excerpting from London Labour and the London Poor, by Henry Mayhew from 1851. I couldn’t find many images of Victorian London sewers, so I’m using this eerie image “The Silent Highway Man” from Punch in 1858. It depicts Death rowing on the polluted Thames River. On applying to the proper authorities, I was obligingly told that they had not the slightest objection to gratify what they evidently thought a very singular taste. I was even asked to name my sewer. They could favour me with an extensive choice. I might choose from about one hundred and seventy miles of legally constituted “main” sewers, running through some hundred and eighty outlets into the Thames; or, if I liked to trespass upon “district” and “private” sewers, they could put me through about sixteen hundred miles of such underground tunnels. They had blood-sewers—a delicate article—running underneath meat markets, like Newport-market, where you could wade in the vital fluid of sheep and oxen; they had boiling sewers, fed by sugar-bakeries, where the steam forced its way through the gratings in the roadway like the vapour from the hot springs in Iceland, and where the sewer-cleansers get Turkish baths at the expense of the rate pavers. They had sewers of various orders of construction—egg-shaped, barrel-shaped, arched, and almost square; and they had sewers of different degrees of rcpulsiveness, such as those where manufacturing chemists and soap and candlemakers most do congregate. They had open rural sewers that were fruitful in watercresses; and closed town sewers whose roofs are thickly clustered with what our scientific friends call “edible fungi.” The choice was so varied that it was a long time before I could make up my mind, and I decided, at last, upon exploring the King’s Scholars’ Pond Sewer, which commences in the Finchley New Road, and ends in the Thames a little above Vauxhall-bridge. If the literary executors of the late Mr. Leigh Hunt had not cut the ground from under me in the title of a book just published, I might possibly have called this chapter A saunter through the West-End. We have all our different ways of looking at London. The late Mr. Crofton Croker had his way, as he has shown in his Walk from London to Fulham; and I have mine. Sewer-cleansers are a class of workmen who seldom come prominently before the public. They have never made any particular noise in the world, although they receive in London every year about five and twenty thousand pounds sterling of public money. Their wages, individually, may average a pound a week. They have never distinguished themselves by producing any remarkable “self-made men;” any Lord Chancellors, or even Lord Mayors; and have never attempted, as a class, to raise themselves in the social scale.” They are good, honest, hard-working underground labourers, who often meet extreme danger in the shape of foul gases, and sometimes die at their posts—as we saw the other day in the Fleet-lane sewer. Some half-dozen of these men, with a foreman of flushers, attended me on the day I selected for my underground survey. They were not lean yellow men, with backs bent by much stooping, and hollow coughs produced by breathing much foul air. Their appearance was robust; and, as I measured bulk with one or two of them, I had no reason to be proud of any superior training. There seems to be only one costume for underground or underwater work, and the armour necessary for sewer-inspecting will do for lobster catching on the coast, or for descending in a sea diving-bell. The thick worsted stockings coming up to the waist, the heavy long greased boots of the seven league character, the loose blue shirt, and the fan-tailed hat, may be very hot and stifling to wear, but no sewer inspector is considered properly fortified without them. There is a fatal fascination about sewers; and, whenever a trap-door side entrance is opened, a crowd is sure to gather about the spot. The entrance to the King’s Scholars’ Pond Main Sewer, that I decided to go down by, is close to the cab-stand at St. John’s-wood Chapel, and twenty cabmen were so much interested in seeing me descend with my guides, that the offer of a fare would have been resented as an annoying interruption. “Rather him than me; eh, Bill ?” said one. “That beats cab-drivin’,” said another. The side entrance is a square brick-built shaft, having a few iron rings driven into two of its sides. These rings form the steps by which you ascend and descend, putting your foot on one as you seize another. I felt like a bear in the pit at the Zoological Gardens, as I descended in this fashion; and I dare say many respectable members of parochial-sewer-eommittees have gone through the same labour, and have experienced the same feeling. Before the iron trap-door over us was closed by the two men left to follow our course above ground, I caught a glimpse of a butcher’s boy looking down the shaft, with his mouth wide open. When the daylight was shut out, a closed lantern was put in my hand. I was led stooping along a short yellow-bricked passage, and down a few steps, as if going into a wine-cellar, until I found myself standing knee-deep in the flowing sewer. The tunnel here is about four feet high, and six feet broad; being smaller higher up towards the Finchley New Road,and growing gradually larger as it descends in a winding course towards the Thames. All main sewers may be described roughly, as funnel-shaped; the narrow end being at the source in the hills; the broad end being in the valley, where it discharges into the river. The velocity of their currents varies from one to three miles an hour. The most important of them discharge, at periods of the day, in dry weather, from one thousand to two thousand cubic feet of sewage per minute, the greatest height being generally maintained during the hours between nine in the morning and five in the afternoon. At other periods of the day the same sewers rarely discharge more than one-fourth of this quantity. The sizes of these underground tunnels, at different points of their course, are constructed so that they may convey the waters flowing through them with no prospect of floods and consequent bursting, and yet with no unnecessary waste of tunnelling. Here it is that the science of hydraulic engineering is required. Turning our face towards the Thames, we waded for some time, in a stooping posture, through the sewer; three of my guides going on first with lanterns, and two following me. We passed through an iron tube, which conveys the sewage over the Regent’s Canal; and it was not until we got into some lower levels, towards Baker-street, that the sewer became sufficiently large to allow us to stand upright. Before we arrived at this point, I had experienced a new sensation. I had had an opportunity of inspecting the earthenware pipe drain—I am bound to say, the very defective pipe drainage—of a house that once owned me as a landlord. I felt as if the power had been granted me of opening a trap-door in my chest, to look upon the long-hidden machinery of my mysterious body. When we got into a loftier and broader part of the tunnel, my chief guide offered me his arm: an assistance I was glad to accept, because the downward flood pressed rather heavily against the back of my legs, and the bottom was ragged and uncertain. I could not deny myself the pleasure of calling this chief guide, Agrippa, because Agrippa is a Roman name, and the Romans have earned an immortality in connexion with sewers. Whatever doubts the sceptical school of historians may throw upon the legends of Roman history, they cannot shake the foundations of the Roman sewers. Roman London means a small town, bounded on the East by Walbrook, and on the West by the Fleet. You cannot touch upon sewers without coming upon traces of the Romans; you cannot touch upon the Romans without meeting with traces of sewers. The most devoted disciple of Niebuhr must be dumb before such facts as these, and must admit that these ancient people were great scavengers, as well as great heroes. Agrippa took a real pleasure in pointing out to me the different drains, private sewers, and district sewers, which at intervals of a few yards opened into our channel through the walls on either side. “You look after branches?” I replied. We went tottering on a little further, with the carriages rumbling on the roadway over our heads. The splashing of the water before and behind us, as it was washed from side to side by the heavy boots of all our party, added to the noise; and when our above around followers let the trap-door of some side entrance fall, a loud booming sound went through the tunnel, as if a cannon had been fired. The yellow lights of the lanterns danced before us, and when we caught a glimpse of the water we were wading in above our knees, we saw that it was as black as ink. The smell was not at all offensive, and Agrippa told me that no man, during his experience in the London sewers, had ever complained of feeling faint while he moved about or worked in the flood; the danger was found to consist in standing still. For all this assurance of perfect comfort and safety, however, my guides kept pretty close to me; and I found out afterwards that they were thus numerous and attentive because the “amateur” sewer inspector was considered likely to drop. At different parts of our course we passed through the blue rays of light, like moonlight, that came down from the ventilator gratings in the highway above. While under one of these we heard a boy whistling in the road, and I felt like Baron Trenck escaping from prison. Some of these gratings over our heads were stopped up with road rubbish; and Agrippa, who carried a steel gauging-rod, like a sword, in his hand, pierced the earth above us, and let in the outer light and air. “They’re nice things,” he said, alluding to the ventilating gratings, generally set in the top of a shaft-hole cut in the crown of the arch. The “gas” alluded to by Agrippa includes carburetted hydrogen, sulphuretted hydrogen, and carbonic acid gas. The first is highly inflammable, easily explodes, and has frequently caused serious accidents. The second is the gaseous product of putrid decomposition; it is slightly inflammable, and its inhalation, when it is strong, will cause sudden death. The third is the choke damp of mines and sewers, and its inhalation will cause a man to drop as if shot dead. These are the unseen enemies which Agrippa and his fellows have constantly to contend against, more or less. As we staggered further down the stream, it was evident that Agrippa had his favourites among the district sewers. Some he considered to be “pretty” sewers; others he looked upon as choked winding channels, not fit to send a rat up to cleanse, much less a Christian man. Looking up some of these narrow openings with their abrupt turns, low roofs, and pitch-black darkness, it certainly did seem as if sewer-cleansing must be a fearful trade. The sewer rats, much talked of aboveground, were not to be seen; and their existence in most of the main sewers is a tradition handed down from the last century. Since the improved supply of water, which is said to give to every dweller in London, man, woman, and child, a daily allowance of forty gallons per head, the rats have been washed away by the increased flood. Although underground, we passed over the metropolitan railway in the New-road, and then along the line of Baker-street, under Oxford-street, and through Berkeley-square. This aristocratic neighbourhood was loudly announced to us by our aboveground followers, down an open “man-hole ;” but there was nothing in the construction of our main sewer, or in the quality of our black flood, to tell us that we were so near the abodes of the blest. Looking up the “man-hole,” an opening in the road, not unlike the inside of a tile-kiln chimney, down which some workmen had brought a flushing-gate, I saw another butcher’s boy gazing down upon his mouth wide open. The flushing-gate was an iron structure, the exact width of the sewer, and about half its height. These gates are fixed on hinges at at the sides of the all the main sewers at certain distances from each other; and when they are closed by machinery, they dam up the stream, producing an artificial fall of water, and so scouring the bed of the sewer. As we got lower down our great underground channel, the roof became higher and higher, and the sides broader and broader; but the flooring, I am sorry to say, became more jagged and uneven. The lower bricks had been washed out, leaving great holes, down which one or other of my legs kept slipping at the hazard of my balance and my bones. We peeped up an old red-bricked long-disused branch sewer, under some part of Mayfair, that was almost blocked up to the roof with mountains of black dry earthy deposit. Not even here did we see any traces of rats, although the sewer was above the level of the water in our main channel. The King’s Scholars’ Pond (so Agrippa told me) has had five feet of water in it, at this point, during storms; but this was not its condition then, or we should hardly have been found wading there. The bricks in this old Mayfair sewer were as rotten as gingerbread; you could have scooped them out with a teaspoon. In Piccadilly wo went up the side entrance, to get a mouthful of fresh air and a glimpse of the Green Park, and then went down again to finish our journey. I scarcely expect to be believed, but I must remark that another butcher’s boy was waiting with open mouth, watching every movement we made, with intense interest. We had not proceeded much further in our downward course, when Agrippa and the rest of the guides suddenly stopped short, and asked me where I supposed I was now? “I give it up,” I replied. “Well, under Buckingham Palace,” was the answer. Of course my loyalty was at once excited, and taking off my fan-tailed cap, I led the way with the National Anthem, insisting that my guides should join in chorus. Who knows but what, through some untrapped drain, that rude underground melody found its way into some inner wainscoting of the palace, disturbing some dozing maid of honour with its mysterious sounds, and making her dream of Guy Fawkes and many other subterranean villains? Before I leave this deeply-interesting part of the King’s Scholars’ Pond Sewer, I may as well say that I am fully alive to its importance as the theatre of a thrilling romance. That no writer of fiction may poach, upon preserves which I have made my own, I will state exactly what kind of story I intend to write, as soon as I have got rid of a row of statistics that are beckoning to me in the distance. My hero will run away with one of the Royal Princesses, down this sewer, having first hewn a passage up into the palace through its walls. The German Prince, who is always going to marry the Royal Princess, whether she likes him or not, will be murdered in mistake by a jealous sewer-flusher, the villain of the story; and the hero having married the Princess at some bankside church, will live happily with her ever afterwards, as a superintendent of one of the outfall sewers. If this story should meet with the success I anticipate, I promise to raise some memorial tablet in the sewer under the palace, to mark my gratitude and the royalty of the channel. If any reader think the mechanical part of this story impossible, let me tell him that two friends of mine once got into the vaults of the House of Commons through the sewers. questions to the men about the treasures usually found in the sewers. The journey was wanting in that calmness, light, and freshness, which generally characterise boat voyages; and while there was a good deal of Styx and Charon about it in imagination, there was a close unpleasant steam about it in reality. Still, for all this, it furnished an opportunity not to be thrown away, and I at once addressed Agrippa. “We once found a dead seal,” struck in one of the men pushing the boat. And not a soul can love! Let us hope that the sewer-doctors and their theories will never reach him, or they might painfully disturb his mind. Still I asked for more. I wished to see one of lie oldest working hands on the sewer establishment; a hoary mudlark who had been seasoned by nearly half a century’s training, and who might fairly be regarded as a hermit of the sewers. With some little difficulty, an old workman was found, who was not, surprised to hear that I had been down various sewers, and took a deep interest in them. Nothing appeared to him more natural than that people should like to go down sewers, and to talk about them for hours together. My companion, encouraged from time to time by my questions, began to unfold his fifty years’ experiences. He was a stout, healthy-looking old man, with a face not unlike a large red potato. He was good-tempered, and proud of his special knowledge; but not presuming. In this be differed from one or two other workmen whom I had met, who seemed to wish me to understand that they, and they alone, knew all about the London sewerage system. His language was frequently rather misty; but a very little grammar will go a long way in the sewers, and working men have something else to think of beyond aspirating the letter H.
“Did you ever hear of any murder being committed in the sewers?” I asked, not being willing to give up the chance of a romantic story without a struggle. “What about that ?” I asked, eagerly. “A human leg?” I asked. “Another human leg?” I asked, in astonishment. It seemed very annoying to me that my companion was compelled to sneeze and cough at this point of his story for about five minutes. “What was the solution of the mystery?” I said, getting impatient. In my inquiries among that curious body of men, the “Sewer Hunters,” I found them make light of any danger, their principal fear being from the attacks of rats in case they became isolated from the gang with whom they searched in common, while they represented the odour as a mere nothing in the way of unpleasantness. But these men pursued only known and (by them) beaten tracks at low water, avoiding any deviation, and so becoming but partially acquainted with the character and direction of the sewers. And had it been otherwise, they are not a class competent to describe what they saw, however keen-eyed after silver spoons. The following account is derived chiefly from official sources. I may premise that where the deposit is found the greatest, the sewer is in the worst state. This deposit, I find it repeatedly stated, is of a most miscellaneous character. Some of the sewers, indeed, are represented as the dust-bins and dung-hills of the immediate neighbourhood. The deposit has been found to comprise all the ingredients from the breweries, the gas-works, and the several chemical and mineral manufactories; dead dogs, cats, kittens, and rats; offal from slaughter-houses, sometimes even including the entrails of the animals; street-pavement dirt of every variety; vegetable refuse; stable-dung; the refuse of pig-styes; night-soil; ashes; tin kettles and pans (pansherds); broken stoneware, as jars, pitchers, flower-pots, &c.; bricks; pieces of wood; rotten mortar and rubbish of different kinds; and even rags. Our criminal annals of the previous century show that often enough the bodies of murdered men were thrown into the Fleet and other ditches, then the open sewers of the metropolis, and if found washed into the Thames, they were so stained and disfigured by the foulness of the contents of these ditches, that recognition was often impossible, so that there could be but one verdict returned—” Found drowned.” Clothes stripped from a murdered person have been, it was authenticated on several occasions in Old Bailey evidence, thrown into the open sewer ditches, when torn and defaced, so that they might not supply evidence of identity. So close is the connection between physical filthiness in public matters and moral wickedness. The following particulars show the characteristics of the underground London of the sewers. The subterranean surveys were made after the commissions were consolidated. Susanna’s note: You can find out more about sewer thieves in this Smithsonian article including additional excerpts from Mayhew. A few days ago, the above image was posted on my Facebook newsfeed. The caption claimed that the woman huddled on the ground was Susan B. Anthony and included an inspirational message about why women needed to vote in this election. Inspired by the striking photograph and being in my usual mode of avoiding housework, I began to surf Wikipedia for information about Susan B. Anthony, Elizabeth Cady Stanton, and Sojourner Truth. As I looked at the photographs of these women, I realized that something was off about the image on my newsfeed; it was too modern as compared to the stiffly posed images of the American women’s rights advocates. 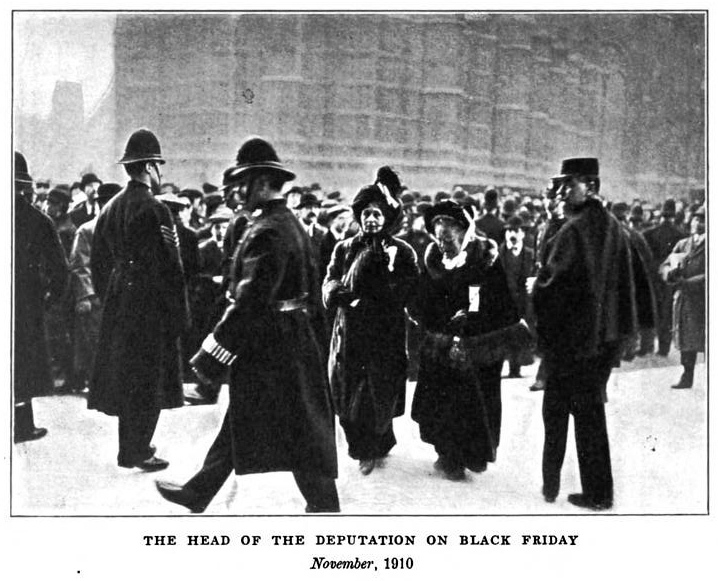 I ran a quick search on the image and discovered that the photograph of the beaten woman originated from a horrifying event in the British history called Black Friday. Black Friday occurred when a bill that would have helped women secure voting rights failed in parliament. 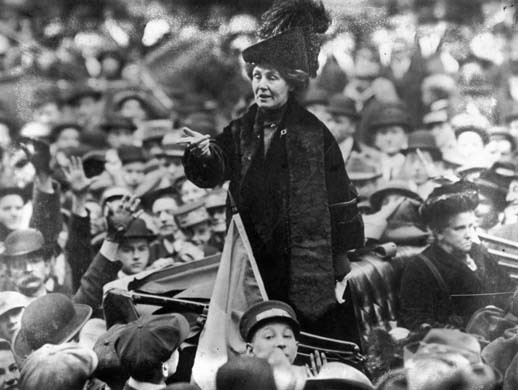 Militant suffragette leader Emmeline Pankhurst, who was known for her window-smashing tactics, organized a peaceful protest on November 18, 1910. The Home Secretary Winston Churchill authorized the London police to use aggressive means to dispel the women. 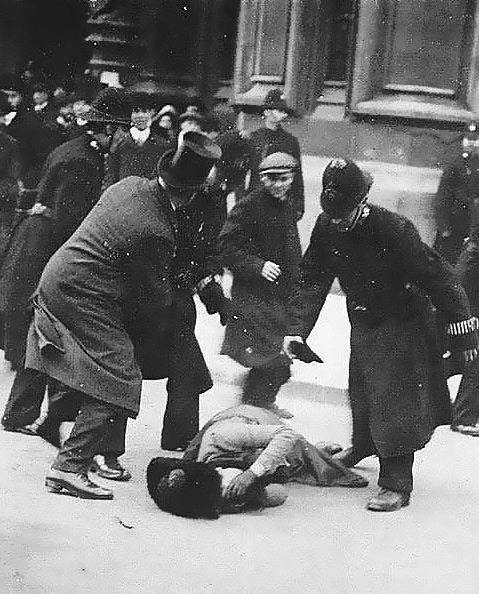 The protesting suffragettes were beaten and molested before finally being arrested. Here is a letter to the editor of The Times concerning Black Friday. The image that appeared on my Facebook stream is actually British suffragette Ada Wright as she appeared on the cover of The Daily Mirror on Saturday, November 19, 1910. In the photograph, she protects her face after having been knocked to the ground several times by the police. The plain-clothed man in the picture is trying to shield her from further violence. You can read an account of the photograph at History Today. This is weird, but I’m having a great deal of difficulty sourcing information on Black Friday. 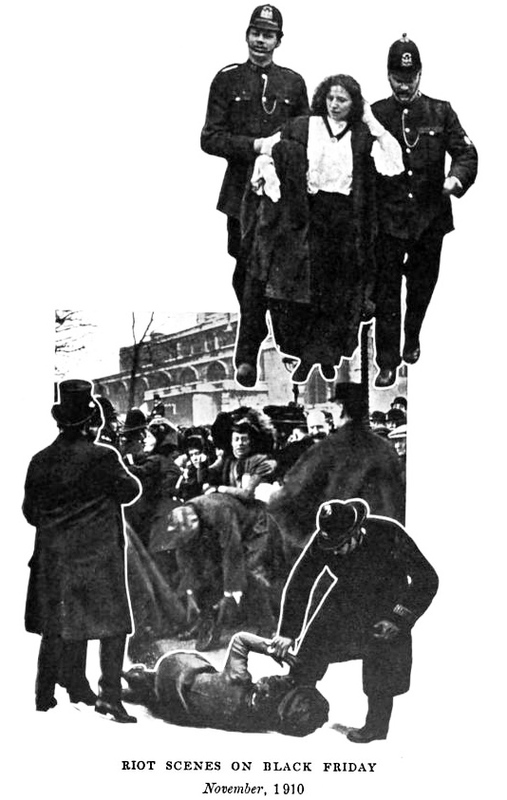 So, I’m excerpting text and using images from Pankhurst’s book My Own Story. What the Government feared, was that the Liberal women would be stirred by our sufferings into refraining from doing election work for the party. So the Government conceived a plan whereby the Suffragettes were to be punished, were to be turned back and defeated in their purpose of reaching the House, but would not be arrested. Orders were evidently given that the police were to be present in the streets, and that the women were to be thrown from one uniformed or ununiformed policeman to another, that they were to be so rudely treated that sheer terror would cause them to turn back. I say orders were given and as one proof of this I can first point out that on all previous occasions the police had first tried to turn back the deputations and when the women persisted in going forward, had arrested them. 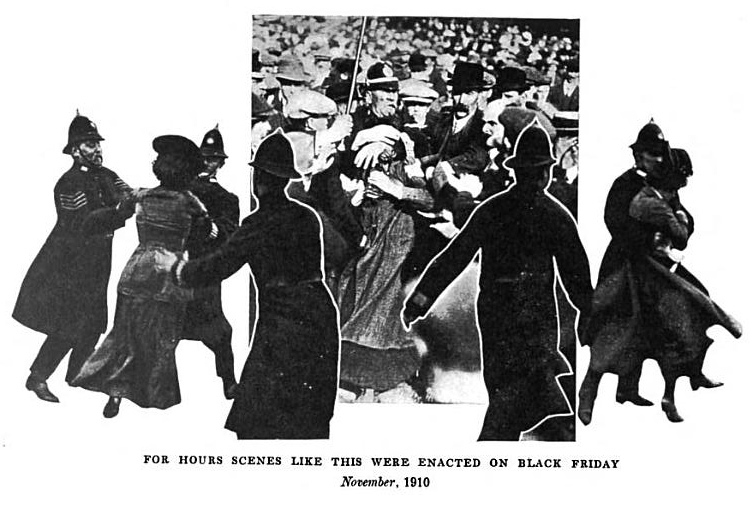 At times individual policemen had behaved with cruelty and malice toward us, but never anything like the unanimous and wholesale brutality that was shown on Black Friday. The Government very likely hoped that the violence of the police towards the women would be emulated by the crowds, but instead the crowds proved remarkably friendly. They pushed and struggled to make a clear pathway for us, and in spite of the efforts of the police my small deputation actually succeeded in reaching the door of the Strangers’ Entrance. We mounted the steps to the enthusiastic cheers of the multitudes that filled the streets, and we stood there for hours gazing down on a scene which I hope never to look upon again. Every moment the struggle grew fiercer, as more and more women arrived on the scene. Women, many of them eminent in art, in medicine and science, women of European reputation, subjected to treatment that would not have been meted out to criminals, and all for the offence of insisting upon the right of peaceful petition. This struggle lasted for about an hour, more and more women successfully pushing their way past the police and gaining the steps of the House. Then the mounted police were summoned to turn the women back. But, desperately determined, the women, fearing not the hoofs of the horses or the crushing violence of the police, did not swerve from their purpose. And now the crowds began to murmur. People began to demand why the women were being knocked about; why, if they were breaking the law, they were not arrested; why, if they were not breaking the law, they were not permitted to go on unmolested. For a long time, nearly five hours, the police continued to hustle and beat the women, the crowds becoming more and more turbulent in their defence. Then, at last the police were obliged to make arrests. One hundred and fifteen women and four men, most of them bruised and choked and otherwise injured, were arrested. While all this was going on outside the House of Commons, the Prune Minister was obstinately refusing to listen to the counsels of some of the saner and more justice-loving members of the House. Keir Hardie, Sir Alfred Mondell and others urged Mr. Asquith to receive the deputation, and Lord Castlereagh went so far as to move as an amendment to a Government proposal, another proposal which would have compelled the Government to provide immediate facilities to the Conciliation Bill. We heard of what was going on, and I sent in for one and another friendly member and made every possible effort to influence them in favour of Lord Castlereagh’s amendment. I pointed to the brutal struggle that was going on in the square, and I begged them to go back and tell the others that it must be stopped. Well, perhaps there were men there, but all all save fifty-two put their party loyalty before their manhood, and, because Lord Castlereagh’s proposal would have meant censure of the Government, they refused to support it. This did not happen, however, until Mr. Asquith had resorted to his usual crafty device of a promise of future action. In this instance he promised to make a statement on behalf of the Government on the following Tuesday. Subdued laughter and, according to the newspapers, some contemptuous booing were raised in the court, and when order was restored the prisoners were brought in in batches and told that they were discharged. *Note 9/3/2017: I came across these photos of suffragettes on The National Archives UK Flickr photostream.